Poll: Wide Divide Over Allowing Muslim Refugees Into the U.S.
A new poll shows six in 10 Americans don&apos;t want the U.S. to allow Muslim refugees from Syria into the country but are more inviting to Christian refugees. An Economist Group/YouGov poll released Tuesday shows a wide ideological split on the question of whether Syrian Muslim refugees should be allowed into the country, with 83 percent of those who identify as conservative opposed and 70 percent of liberals saying they favor allowing them entry. But 61 percent of moderates also oppose allowing Muslim refugees from Syria into the country. The Nov. 13 terror attacks in Paris raised calls to halt the resettlement of refugees from Syria on fears that ISIS terrorists could slip into the country, although all of those identified so far as carrying out the attacks are native Europeans. The United Nations High Commissioner for Refugees has recorded 4.3 million refugees fleeing the civil war in Syria and the brutal Islamic State regime that has taken control of large areas of Syria and Iraq. The House last week passed a bill that would limit Syrian refugees coming into the country with enough Democratic support to withstand a threatened presidential veto. Republican presidential hopefuls staked out their positions with conservatives, saying the U.S. should block any Syrian refugees from entering the country, and establishment candidates called for a pause until the screening process is improved. Former Florida Gov. Jeb Bush and Texas Sen. Ted Cruz advocate allowing Christian refugees into the country, but not Muslims. The poll found respondents were more accepting of Christian refugees, with 56 percent favoring only Christian refugees resettle in the U.S. and 44 percent opposed. The divide between ideologies wasn&apos;t as wide, with 72 percent of liberals in favor of allowing Christians into the country and 52 percent of conservatives opposed. 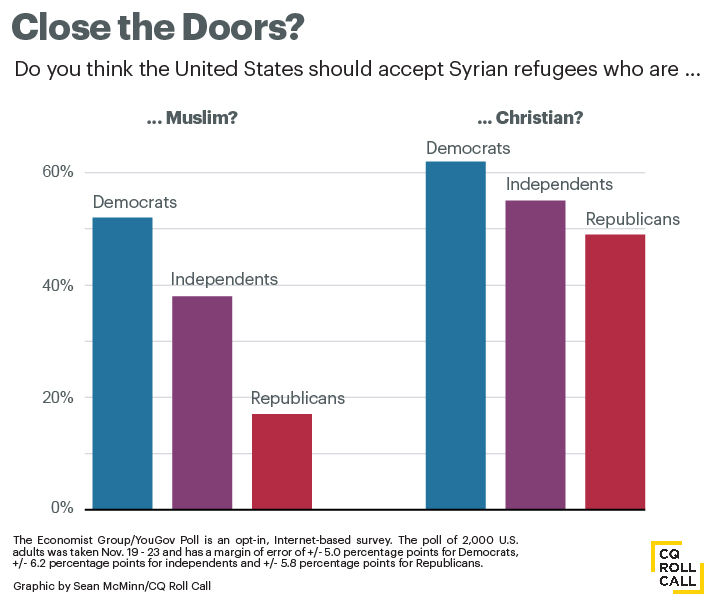 Independents favor admitting only Christians fleeing Syria by a slightly larger margin, 55 percent to 45 percent. Rep. André Carson, one of two Muslims serving in the 114th Congress, told MSNBC Monday that the anti-immigrant rhetoric is regrettable but not unexpected. Rather than shutting out people of different faiths, Carson said he and Rep. Keith Ellison, D-Minn., are advising colleagues to draw on the strength of the Muslims already woven into the fabric of their communities.